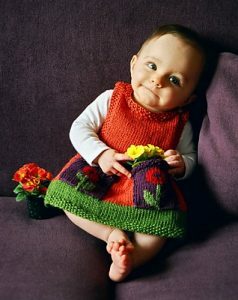 Anouk Baby Dress Knitting Pattern Free. Anouk is a pinafore that will grow with a baby. At first it is a dress and will gradually become a tunic. The side bands can always be lengthened when the baby’s chest size is larger, so it could be worn over a shirt later.